Property 20: Bonn: Bright and cozy 30's house. Rheinpromenade 2min. on foot. Your home in Rech in the Ahr valley. The entrance to the red wine trail and Ahrsteig. 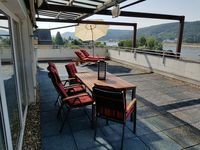 Property 23: Your home in Rech in the Ahr valley. The entrance to the red wine trail and Ahrsteig. Property 29: In the hotel you are a guest, with me you are at home. Spend time in our apartment Felix! Property 36: Spend time in our apartment Felix! Very convenient free parking. The platform is huge and with a super great view on Rhein river. The town very quite, but still easy for shopping. The rooms are clean and neat. The kitchen would be great if equipped with an oven.